Today HTC has announced a smaller version of the HTC One (M8), but the phone is one of the many ‘mini’ phones that also cuts the specs, as if customers wanting a smaller phone don’t want the same performance. The excellent One (M8) is powered by Qualcomm’s current flagship Snapdragon 801, but the new One mini 2 (great name, by the way) resorts to using a Snapdragon 400 SoC with just 1GB of RAM. Snapdragon 400, by the way, is the same SoC as used on the Motorola G.
So while the phone keeps the awesome BoomSound speakers from the M8, and even gets a 13-megapixel camera instead of the 4-megapixel duo-camera, the performance is never going to be in the same league as the M8. Nor is the One mini 2 going to be selling for anywhere near the same price as the recently announced Moto G 4G. Sure, the Moto G doesn’t have the same premium build, speakers, or camera, but it’s also selling for £149 or less in its 4G version. The One mini 2 hasn’t got a SIM-free price announced yet, but it’s pretty much guaranteed that it won’t be anywhere close. Let me get one thing straight: I don’t think the One mini 2 is going to be a bad phone. The Moto G has proven that Snapdragon 400 is an excellent chipset, balancing good performance with low power consumption, but it’s just falling short of where it should have been. There must be a sizeable number of customers that aren’t willing to accept that a 5-inch is now becoming the minimum screen size to buy into, in order to get access to the best performing hardware. Some will see a phone with a 4 to 4.5-inch screen as the largest thet’ll accept, for the convenience of a more pocketable form factor. It doesn’t even matter that it will likely end up thicker to accommodate the battery, as it has the added benefit of feeling more substantial than the ultra-thin phones, many of which feel like they’ll leap out of your grip if you so much as cough. Yet unless you buy a Sony Xperia Z1 Compact (a 4.3-inch version of the Xperia Z1, keeping the same Snapdragon 800 CPU and 20.7-megapixel camera), you’re going to have to accept that most manufacturers now consider you to be worthy of nothing more than a mid-range phone if you dare look for a smaller screen. Good news for Sony, but a missed opportunity for HTC and all the others. This isn’t just my opinion, however, as you only need to look at the comments on web sites and forums to see that an increasing number of people are starting to get quite vocal about being forced to buy the most expensive big-screened model in order to enjoy the same level of performance that makes some apps and games a far more enjoyable experience. Perhaps it’s time for HTC and others to start noting these opinions when designing their future mini creations, so I can stop repeating them every time another disappointing ‘mini’ phone is announced. 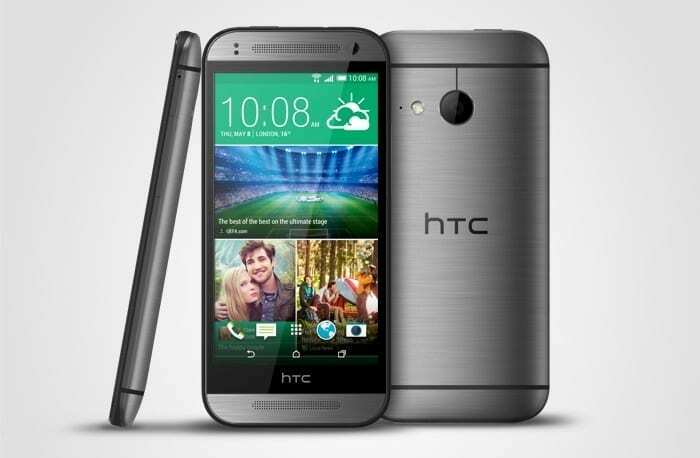 Three and EE has confirmed it will be selling the HTC One mini 2.